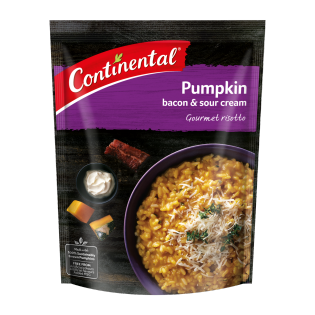 Made with responsibly grown New Zealand pumpkins, this Pumpkin, Bacon & Sour Cream Risotto is sure to be a ‘go-to’ during cold winter nights. Stir through goat’s cheese and baby spinach and sprinkle with toasted pine nuts for a hearty, satisfying dinner. Risotto rice (74%), vegetable powders [pumpkin ^ (6%), potato flake, onion ,tomato, garlic], maltodextrin, natural flavours (contain milk), corn starch, sour cream powder(1%), sugar, bacon powder,(0.8%), yeast extract, mineral salts (451,452), cheese powdes, salt, chives, sunflower oil, colour (paprika), black pepper. ^From responsibly grown pumpkins. Contains naturally occurring glutamates. Allergens:Contains milk products. Made on equipment that also processes products containing wheat, soybean, peanut, egg, sesame, fish and crustacea. Stove Top – for best results 1) Bring 1½ cups (375mL) hot water and Risotto pack contents to the boil, stirring 2) Simmer, covered for 15 minutes, stirring regularly until rice is cooked. Remove from heat, stir through 1 teaspoon Flora Buttery spread, replace lid and stand for 2 minutes before serving. Microwave (900W) – cooking times may vary 1) Combine 2¼ cups (560mL) hot water and Risotto pack contents in a microwave safe bowl. 2) Cover and cook on HIGH for 15-16 minutes, stirring 2-3 times. Stir through 1 teaspoon Flora Buttery spread, replace cover and stand for 2 minutes before serving. FOR A COMPLETE MEAL… Stir through baby spinach and goat’s cheese and sprinkle with toasted pine nuts.